CRAIG MacGILLIVRAY credited his early-season form to his Pompey team-mates. The keeper has made an impressive start at Fratton Park since joining on a free transfer from Shrewsbury Town this summer. MacGillivray has kept three cleans sheets in seven League One appearances, conceding just four goals to date. Last Saturday’s 1-1 draw with the Shrews ended a run of successive shutouts for the 25-year-old. The Blues’ ability to not ship goals has been key behind their rise to second in the table following five wins and two draws. Although MacGillivray is happy to earn plaudits for Pompey’s defensive displays, he knows they’re not all down to him. The former Walsall man believes the pressing and work-rate of the Blues’ forwards and midfielders has played a significant part. MacGillivray said: ‘A clean sheet gets put on the goalkeeper and back four but it doesn't come from just those individual players but the whole team. ‘Defending starts from the front, with the forwards pressing then the midfield and so on. 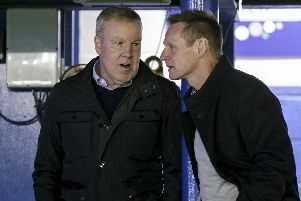 ‘Yes, it's nice for defensive players to get the recognition for clean sheets. But, ultimately, it goes under a team effort. ‘So far we're doing very well defensively and if we do concede it's very minimal.'. MacGillivray has quickly endeared himself to the Fratton faithful with a string of eye-catching performances. Not only has his shot-stopping ability proved adept, but his judgement to collect crosses has been dexterous. The Yorkshireman puts that down to carefully reading each situation. He added: ‘I think there's a fine line for when you come for crosses. ‘Some people get their heads so driven towards having to come for things and don't get there. ‘You've got to be very careful and pick the opportunities where you feel comfortable to come for things. ‘I'm very happy to come for things if a ball's not driven or there are not many bodies in the way. ‘I've come through bodies a few times already. I don't mind because it takes the pressure off the back four. ‘If you can't come and get it then you make sure you're set to try to make a save.